USB problem is the first thing to arise with Raspberry Pi when plugging-in peripherals. This isn’t exclusive though, learning that my Linux laptop also has it and the higher ARM architecture, BeagleBoard-xM, also experiences the same issue sometime. But with Raspberry Pi (RPi) in the universe of many viable USB device options, you’ll definitely need to double its popular credit card-sized form to have powered USB-hub docked next to it, although Y-cable with separate power assistant injecting the USB device directly is sometime adequate. Doesn’t leak power back to RPi via USB port (check this by unplugging the main power, then check the red LED indicator) as this will interfere with the reboot command (physical state vs software). kernel: [ 1803.780601] phy0 -> rt2x00usb_vendor_request: Error - Vendor Request 0x07 failed for offset 0x101c with error -110.
tail of the above syslog is saying error with the (1) ethernet (this is actually also a USB 2.0 but not appearing in lsusb command) and (2) the WiFi stick used (in this case with RT5370 chipset). Then, of course (3) doing things with the just plugged modem you’ll expect more instability. I mentioned BeagleBoard-xM which also came with similar USB ethernet on-board. Unfortunately, Beagle was more stable when my case was to have it stream a zoom-camera input to internet (check my YouTube demo). The camera decoder and modem were both USB plugged without Y-cable or additional power supply. As a standalone system, part of the design was to reboot under trouble detected by the software. Again, OS command reboot is not achievable consistently with the RPi when power backfeeds through USB port. 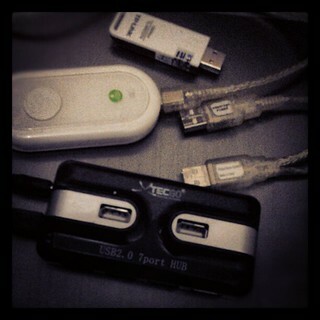 As an absolute requirement for me, I found a powered USB-hub available in Indonesian market as 7 ports XTec Go. Yes, it leaks power back as confirmed by the vendor-product ID 05e3:0608 of the chipset listed in eLinux Wiki lists with a bunch of different names (judging the picture, Hama is closest). My el cheapo USB-hub, HDSPA modem, and WiFi stick are the matchmaking of brands shown in the above image. It achieves long uptime like 6 hours serving internet when RPi used as router. I still use separate AC power adapter on the go with me: regular 700 mA that comes with smartphone will do for the RPi, while for the USB-hub, I have 2A rating from tablet charger. However, I’ve also plugged separate 500 mA charger for the hub without problem and/or excessive heat (you need to touch the supply sometime to feel any nasty heat as some of them might have been low quality build that could blow up. Yes it did). My plan with mobility is to have power bank with dual USB charging output (this Hame has 1A and 2.1A) when no AC source nears. Have I tested other USB modem stick? 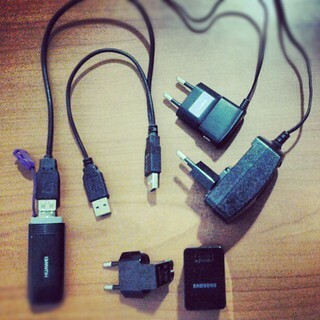 Check my other post related to usb_modeswitch. © logIt. Powered by WordPress using the DePo Skinny Tweaked Theme.